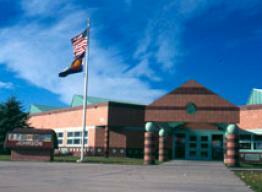 Johnson Elementary School was named in honor of Mary and Curtis Johnson, two lifelong Fort Collins educators. Johnson is a quality, comprehensive community school that offers a full range of academic services to support students towards mastery of the Colorado Academic Standards. Students’ academic achievement is also supported through the Positive Behavior Instructional Support system, and students are celebrated who follow the P.R.I.D.E. expectations each month. All grade levels enjoy long, uninterrupted blocks of time for literacy instruction. Additional literacy staffing allows Johnson staff and teachers to provide more individualized time for instruction and guided practice. Students enjoy a weekly rotation of “specials” classes including art, music, physical education, counseling, media and technology. These programs allow students to explore their creative interests and participate in art shows, concerts, track meets, and honor choirs. Two computer labs are fully networked and equipped with many instructional programs. The school also offers several before and after school enrichments: Climbing Club, Running Club, Honor Choir, Art Club, Lego Robotics, Homework Hotel, Rocky Buddies and many others.